Thank you, thank you, thank you!!! For all your visits, delightful comments and enthusiasm you send to me. I am truly amazed and appreciate your encouragement. In reply I have made up 4 packs of greeting cards to give away. 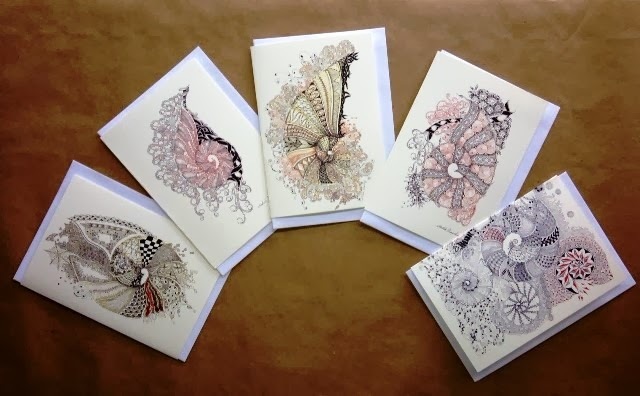 Each pack contains 5 different cards of my favourite Zentangle Inspired Art. Just choose the pack that you would like to receive in the mail and leave your choice in the comment box. You have until next Friday to make your selection. The winners will be announced on Saturday (Australian time). Oh how wonderful to have a chance to win this giveaway. Thanks so much. My choice would definitely be the cards featuring spirals. These cards are gorgeous! I would be happy to win any of them! I think pack #3 with the squares would be my favorite. Thank you for the chance to win. i think your work is fabulous!! your blog is one of the only ones i look at daily! the beautiful circle cards have my name on them!! Ooo, ooo, ooo! Spirals! or squares. What a lovely offer! Thank you. I love pack 2 - circles, even though any would just be over the top. I, too, check your blog every day for new inspiration. Thank you so much for sharing with all your fans. I love them all. It is hard to choose but I'd have to say circles! Absolutely gorgeous all of them. Spirals are so amazing. Oops I would be anonymous. They are all so beautiful it's hard to make a choice so I will leave it up to you if I'm so lucky as to be a winner. Thank you for sharing your beautiful work. The spirals, please, the spirals. They're so dreamy and beautiful (well, all of them are beautiful, but spirals are my favorite). Thank you for the giveaway!!!!! You rule!!!! It is so kind of you to make this offer. I will select the spirals, although it was a difficult decision because all of them are beautiful. Thank you for doing this. My preference lies probably with the squares and a bit of colour, but wow they are all beautiful. Oh shelly how generous of you to give away such beautiful cards. Your work inspires me all the time, so it would be great if I could see some pieces of you in real. I love all the packs, but since you want us to choose , wich is a very difficult challenge, I would say the touch of color is my favorite! I'd love the Touch of Colour pack. My Zentangles rarely have colour in them, as I'm no confident with colour, your Colours are so delicately done, they appeal to me more than garish colour choices...Happy times ahead for you.. Barbara. You are one of my favorite artists. Any pack would be a delight but I am partial to circles. You have been my invisible mentor.......love your designs so any pack would be a delight, but must admit I lean towards pack 3, the squares. Thank you again for all you have done, for all of us! What a wonderful opportunity! I love your work. I would love to win any of the cards but the spirals are my favorite. Wow Shelley, I would be happy to have any of these packs. 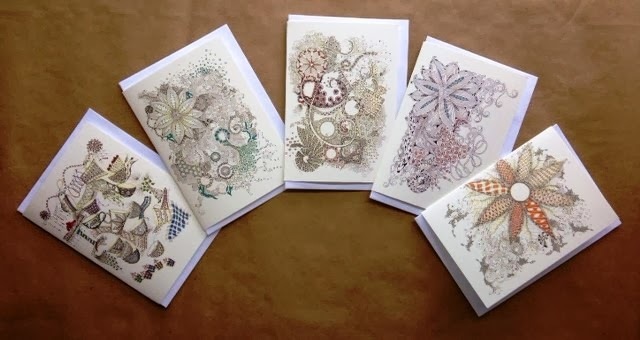 I am still in the very early learning stage with my Zentangle and these would provide such inspiration. Thanks for the opportunity to win. I would have to go for the colour pack! I am a beginner and am too scared to get out the water colour pencils I was given for Christmas. So I need some inspiration and courage. The only problem would be using the cards. Couldn't give them away.....much less write on them! I love all of them but think if I had to pick one it would be the spirals. I have so many people in my life that would love to receive one of these for there birthday, that's if I woukd be willing to part with any. Lol! that is a tough one, they are all beautiful in their own way!! i would like to say any of them would be amazing to win!! very beautiful, i hope my tangles can someday look like that! All are beautiful. But pack #2circles would be my choose! oooo, I am entranced by your spirals, so they would be my first choice. actually, I would be delighted to receive any of the work you do, it is all exceptional as well as inspiring. They are all beautiful like all of your work! Inspirational! The squares would be my choice. Thanks for being so generous! Your art encourages me to keep trying Zentangle, one line at a time. 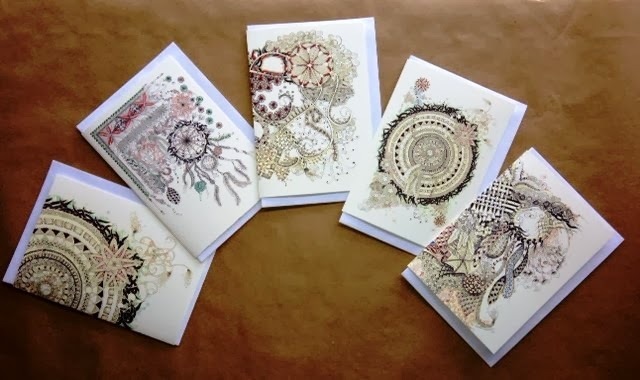 I would be thrilled to win a set of the spiral art cards. They remind me of shells and the fun times with family hunting for them at the beach. Thank you Shelly for this opportunity to win some of your artwork! 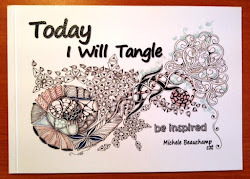 Your designs are very inspirational.....I was particularly drawn to your spirals. I yearn for the ocean but am as landlocked as I can get here in Minnesota (US). Please continue to create! Wow - what a treat! You have been such an inspiration. I am still in the learning stages but am enjoying the journey. Any pack would be great but if I could only have one it would be the coloured pack. They are all beautiful! If I had to choose, I would choose the spirals. But I would be delighted with any of them. Thanks! Shelly you are fabulous and I'm really digging Pack 4 - Touch of Colour! Awesome art as always!!!! I love your art but what I love more is your generosity to share this art. Thanks. I would love any of your packs but I am leaning towards the squares. Would be honored to have any of your cards. Best of luck to you. Shelley, Your work is so inspirational. I'd love to have a pack of your notes cards - I really love your spirals (Packet 1). In addition to being an inspiration, I really admire your generosity - that is what makes this blog world so wonderful. Beautiful work, Shelly! Thanks for your generous offer.Love them all - pack 2 (squares) if I have to select one. Hi Shelly I just love all your work it is so inspiring. I have learnt a lot from your blog. If I had to choose one pack it would be Spirals. All the packs are lovely but my favorite is pack 2, the circles. Circles are cool. Hard to choose. #3 is my favorite, but I would take any of them if my name was drawn. Pack #1, Spirals. Anything you draw is my favorite, however! All of them are gorgeous, but your spirals have always been my favorite. What beautiful cards! I follow your blog via email, and enjoy it very much. If I should win, I wouldl prefer the #3 set squares. If this is not available, then any of them would do. I am 94 years old and enjoy zentangling every day. 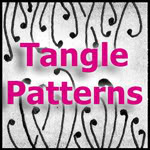 I have a blog with some of my zentangles and other art, if you would like to look. It is Sarah's Art Treasures - treasuredarts.wordpress.com. As you are my "go to" spiral aficionado, I would definitely pick the spirals. So glad our paths crossed briefly at CZT training. You are a delight to follow. Thanks. Wow! They are beautiful! Hard to choose. I would go with Touch of Color. These are beautiful. And you are so gracious to offer your creations as a gift. Everyone receiving a gift will treasure them for ever. All of them are exquisite. I love circles so if I were chosen that would be my preference but receiving any of them would be an honor. Such a hard choice!!!! I think the touch of color set shows your work beautifully , & I would love to receive those!!! Thanks so much!!! These are beautiful and I would be thrilled to receive any of them, but I have to say set #2 is my favorite. Thanks for all of your inspiring work. You truly have a gift! They are all beautiful and I would be delighted to receive pack #4. Your work is very inspiring. Thank you for sharing your work with us. One hour up and already 58 comments! You are a sensation! I love circles but, have always lusted(yes, that's right) for your spirals. They are all beautiful. Enjoy your summer. Wow! Love them all! Love visiting your site always. I would have to say pack#1-Spirals for me. Thanks so much! Your work is so incredible. I also love them all, but am especially drawn to the spirals. Thank you so much for sharing with us! Your cards are lovely. I love your circles. Like a circle may your kindness go around full and return to you in Whispers of Aloha. I have been following your blog for about a year now and have loved each one of your posts. My favourite usually include spirals and / or plant-flowerlike tangles, so I would very much like to receive your "Spiral" pack or the "Touch of colour" one. Thank you ever so much, for your art and this giveaway! Touch of color touches my heart! Happy Valentine's Day and thanks for your lovely work anymore importantly your sharing! Hugs! It is so hard to choose just one! They are all fantastic! I think number 1 is my favorite. Hi Michele, I just love all of your work I am so inspired by it! If I were the winner it wouldn't matter which one I received each one is such a Beautiful set. It is so generous of you to give these 4 sets away. Wow! What a tough choice. I would say Circles and Touch of color are my favorites but all look beautiful. What a nice gesture on your part to share your great art work with us in this way. Michelle, you are a prolific and talented artist and I think you for the chance to win. I am drawn to Spirals and Circles and Touch of Color, but for some reason am not caring for Squares too much. Impossible for me to choose just one ... sorry. If you choose me it's up to you, depending on the others' preferences. How generous, thank you - all are lovely and what a treat it would be to be selected to receive this gift. Definitely the Squares for me then again Spirals would be right up there. I love them ALL! I will pick squares, but I would be happy with any of them. I love your work and follow your blog. 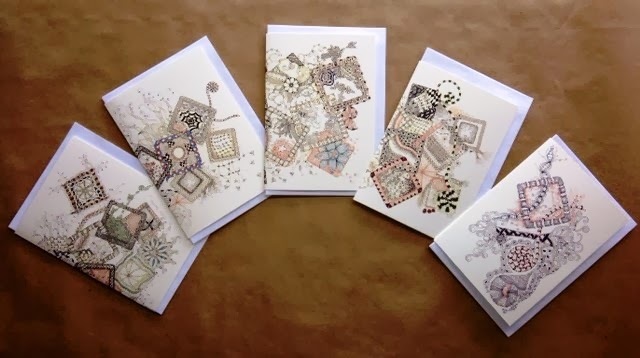 I would love to have the square Zentangle Cards although they are all beautiful. I have enjoyed your work and been inspired by it over the years. You are a very talented and original artist. Keep up the good work and thank you for sharing it with all of us far away but close via cyberspace. Hello,Shelly. Thank you so much for giving me the opportunity to win one of your beautiful packs of cards. They just might end up in frames, as I absolutely love your work. My choice would be the spirals, if I was fortunate enough to win. Happy Valentines Day! Shelley, these are beautiful! I would love the opportunity to win a pack of your gorgeous Spiral cards, your work is Wonderful and Inspirational as always! Oh my, I just love them all! But if I had to choose, it would probably be the circles or spirals! We've been in a black-out for a bit ... lights returned and I found your post ... (crowd screams in background!!) How can I pick? Your works are all so stunning ... I'd be happy to hold whichever pack of cards might come my way! Thanks for all the work you do to inspire so many!! Spirals, Circles, Squares, and Color OH MY! which one to choose...it's impossible! They're all so wonderful and inspiring! I'd love to have any of them, so if I win I'll let you choose. How wonderful of you to give away these card sets. I would, if I'm picked that is, card pack #2. It was hard to make a choice. Thanks for sharing your art always. oh what a lovely and generous offer! Whichever I won, if I won, would be a delight to have. What a Super great giveaway ! I love to win a pack, but cannot choose witch one, love them all. But if I really have to choose than I choose the Spirals or Squares. Wow, what a delightful and generous give away. Fingers crossed that I'm lucky enough to be gifted a spiral set. It was difficult to choose as they're ALL so lovely. Thanks for offering this...seriously, THANKS! How wonderful!!! Your work is very inspirational. I love all four sets but if I had to pick just one I would pick #1 (spirals). Thanks!! I love your artwork. Love the detail. If I am chosen, I would like packet#3. I have to choose Spirals - difficult as the choice is - as you are absolutely my spiral heroine!! No one curls 'em quite like you do. All of your work is extraordinary......my favorite has to be the spirals. Thanks for all the inspiration. I follow your blog regularly and am always amazed at your stunning work. Such creativity! I would dearly love to win the spiral pack. Thank you for sharing your talent. Bonjour, Votre blog, me donne beaucoup d'Idées, C'est toujours très bien fait. Pour moi je préfère le Pack 4 - Touch of Colour! Où Car j'habite (France) Nous avons un temps très gris et qu'un peu de couleur réchauffe le cœur et les esprits. Même si les spirales m'impressionne beaucoup. Bonne journée. I am ashamed to say that I have spent more time looking at tangling blogs rather than actually doing them and I really need to back into it. I love your spirals, the circles second, and a touch of colour is pretty too. Thank you Michelle for your inspirational blog! Just love your art - all of it. My favourite though would be the spirals. Thanks for the opportunity to have some of your delicious art in my home. What beautiful work! Would love to win a set of your cards and see your work in person. I would love to see the spirals! Shelly - Your work always makes me happy. Your's is an amazing gift. That you share it with us so often is precious. If I were to win, I would love the circle pack -- but as with many other posts, any you sent would be a treat! Thank you for all you do for us!! Tricia C in Nashville! Wow, what a chance! I would love any but my favorite is pack four. You are one generous lady and so inspirational. Thanks for offering a bit of you to us! All of your work is so beautiful...hard to choose! Spirals would be my first choice. You were my first Zentangle "crush". Thanks for the wonderful offer and your inspiring work. I would happily take the touch of color cards. Oh, this is so sweet of you. I knew you trough the Diva and since I come here often to dream and let your beautiful work percolate. Thank you for sharing. The squares would be my choice. Who wouldn't be delighted with any one of them. They are all fabulous...but if I had to make a choice it would be the circles. Hello Shelly Beauch. I'm not writing this comment to take part in the lucky give away thing, and to be accurate I have no idea what time it might be in Australia as I post this comment. I just wanted to say (again) that I really take great pleasure in admiring your work and can't help but be inspired by what you do. The sharing of your work is all I need to feel gratified I am the lucky one here, so thank YOU! Thanks Nat, you have just made it in time. Amazing response, thank you so much!